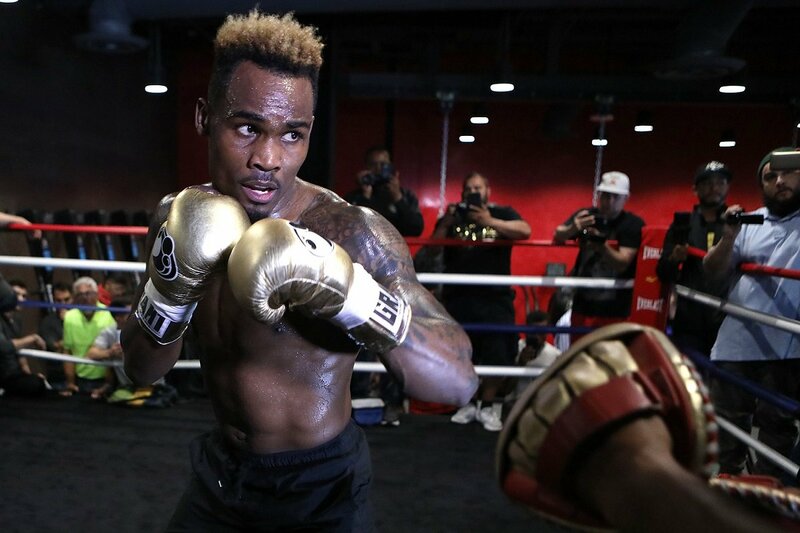 Unbeaten super welterweight world champion Jermell Charlo has arrived in Los Angeles ahead of his upcoming showdown Saturday, June 9 live on SHOWTIME against former champion Austin Trout as part of action from STAPLES Center in Los Angeles in an event presented by Premier Boxing Champions. The SHOWTIME CHAMPIONSHIP BOXING telecast beings at 10 p.m. ET/PT and is headlined by the featherweight world championship rematch between Leo Santa Cruz and Abner Mares. Tickets for the live event, which is promoted by Ringstar Sports and TGB Promotions, begin at $50, plus applicable fees, and are on sale now. To purchase tickets visit AXS.com or click HERE. “I’m ready to go. I’m well-prepared. I’ve been in training camp for about 10 weeks. When you guys saw me before, I wasn’t this built but now I’m ready and I’m excited. I can take on any man in this division. “Training camp was great. We had world champion Errol Spence Jr. in camp and a bunch of undefeated fighters. I stopped a few, dropped a few, but that’s not the name of the game. It’s all about training and getting the work done to be prepared for June 9. “Trout is a veteran fighter but I don’t believe he’s going to stand in the pocket and try to fight me. I don’t think there’s a single fighter in this weight division that would try to do that, not even [Jarrett] Hurd. If Trout does try that, the night will end fast. “I’m definitely growing as a fighter and growing as a man. If Trout wants to bang, let’s bang. I don’t care what Barry Hunter has or what he does, it’s not going to be able to beat me and Derrick James. I don’t necessarily think Trout is as tough as me so if he can’t put up the skills and match my ability, he won’t beat me that night. “The Lara-Hurd fight was a great fight. Hurd did what he had to do but I’m a completely different fighter from Erislandy Lara. I’m not here to waste punches. I’m not saying Lara didn’t do a great job but I do believe that his conditioning wasn’t there. I’ve focused my whole life on training. I’m single, I don’t have a family that I have to focus on like some of these other guys. It’s all boxing. “This is a doubleheader. I’m not a co-main event or a featured star bout. I did that years ago. How many people leave after I fight? Everybody left after the [Erickson] Lubin fight. I’m going to continue to do what I do. I definitely want to headline for you guys and do it here at STAPLES Center and possibly in Brooklyn. I prefer L.A. though, it’s all nice people and palm trees. They don’t have that in New York. “I have a great team behind me that won’t allow me to get distracted by the bright lights of L.A. I don’t believe that it’s in my mind to worry about anything outside of the ring. My objective is to win Saturday night and then I can get out of the ring and have a great time with my brother. “I’m trying to come in and change some things about boxing. I believe I can make it happen. I think every boxer should have their own media day. [Leo] Santa Cruz had his own media day. Abner [Mares] had his own media day. I had my own media day. If we can continue that task as fighters, I think it will bring a much bigger audience to boxing. “I don’t think that whenever the WBC reaches out about a fight that they’re doing it just to play around. This sport is serious. We would love to be a part of a GGG fight. We’re tired of hearing the media say to put the Charlos in there with better competition. I’ve heard that every fight. As long as I’m winning fights and I’m entertaining the fans, that’s what I’m going to do. “I think I could definitely fight at 168. I might just keep growing through the weight divisions. It’s easy. “I was super excited about the video that came out today with Gizzle. It was astounding to me to see an artist come out and produce a song like that about the Charlos and it was even better with the video of the knockouts that me and my brother have. “[Jermell] sparred with Errol [Spence] yesterday and he looked phenomenal. He feels great. I think he and Errol are really similar in their level of fighting. At this point he makes weight pretty easily, he’s doing well and I know he wants to unify. So, until that happens I see no reason for him to go up in weight. Right now, with Austin Trout we’re facing a physical fighter and a physical threat to everybody. With him it could be an easier fight or it can be a hard fight. As we know Jermell is a phenomenal fighter who’s very skilled so I’m not thinking about they’re what doing. [Jermell] might be but I’m not. “Austin Trout is a great guy and he’s a great boxer. Even at an older age, his skill set is so good. If you think about Floyd [Mayweather], even at an older age he was beating everyone he was fighting. So, the way I look at it is that he is going to come back hungrier and he’s looking at this as getting an opportunity to get a new fight. “I always go in thinking it’s going to be a tough fight. I can’t go in there thinking of it in any other way. If I was thinking it would be easy, I’d be an idiot and I wouldn’t be here now. I have to keep pushing myself to be better and these guys will be ready for a tough fight. The highlight reel compiles must-see moments from the identical twins who have knocked out nine of their last 10 opponents since initially becoming world champions. The 28-year-old Houston natives now sport a combined record of 57 wins, zero losses and 36 knockouts. Jermell (30-0, 15 KOs) makes the third defense of his WBC Super Welterweight World Championship against former titlist Austin Trout next Saturday, June 9 live on SHOWTIME at 10 p.m. ET/PT. Jermall (27-0, 21 KOs) is a former 154-pound champion who relinquished his title to pursue the world’s best 160-pound fighters. Jermall picked up the Interim WBC Middleweight Title April 21 on SHOWTIME and is the WBC’s mandatory challenger to Gennady “GGG” Golovkin. Next boxing news: Canelo vs. GGG II: WBC…Change of Heart?